While I wait for a coupon to purchase an invisible zipper foot to finish my maxi dress, I’m eager to get back into sewing. I recently picked up two yards of a fabulous cotton from FineFabrics.com. It’s bursting with colors from the Fall 2011 Pantone palette, and it’s punctuated by bold blocks of white. Best of all, it has a subtle ribbed texture running perpendicular to the blocks of color. It truly is an amazing piece of fabric. …a jumper, maybe something inspired by a 1970’s candy striper uniform, or cute little blouse with pleats at the neckline so the blocks can grow in dimension juxtaposing horizontal to vertical. Also great for a gathered or gypsy skirt, or Summer dress. I am inspired to create a skirt that takes advantage of the pattern play suggested by pleating. 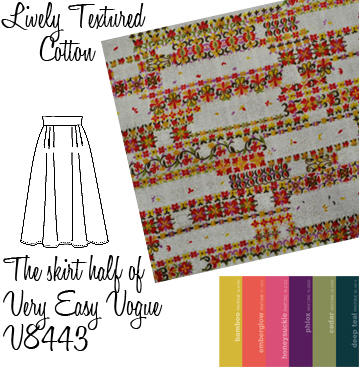 I will be using the skirt portion of the pattern Very Easy Vogue V8443. I’ll just double the waistband pieces to create a waistband facing, shorten the zipper, and, voilà, a skirt! Everything’s ready to go, so I imagine you’ll be seeing this skirt at least once in Self-Stitched September ’11. Fun! This will look great as a pleated skirt! Great idea using skirt portion of the dress – will view dress patterns differently now. Can’t wait to see it finished – no pressure.